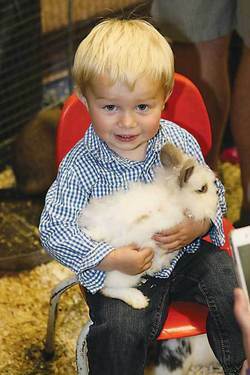 Little Spencer Jones found a fluffy friend at the Petting Zoo in the Family Fun Fair at the Leduc Black Gold Rodeo. It seemed to take forever to get here and then it was over in the blink of an eye. The Black Gold Rodeo has once again come and gone and the only thing left are a few carnival prizes and the hoof prints on our hearts. This year had a bit of a twist as the rodeo seemed to be all about the ladies! It all began when Miss Rodeo Canada, Gillian Shields, graced us with her presence for the entire weekend. She could be found at almost every event within the Black Gold Rodeo including riding the Canadian Flag around the arena during the opening ceremonies at each night's performance, as well as signing autographs and posing for dozens of photographs at the Rodeo of Smiles, and chatting with hundreds of participants and attendees throughout the weekend. The Black Gold Rodeo was almost overrun with lovely ladies as Miss Strathmore Stampede Becca Walters, and coming all the way in from south of the border Miss Rodeo Colorado Sarah Wiens, was in attendance as well. And as if that wasn't enough, for the very first time ever Miss Stampede Indian Princess Amber Big Plume came up for the Black Gold Rodeo parade and to enjoy Leduc's hospitality for the day. This year outside the rodeo arena wasn't the only place that girls were attracting major attention. Canada's first and only female Pro Rodeo Bronc Rider, Kaila Mussell, came out to show the boys how it's done. Kaila climbed aboard 1200 pounds of fury at the Sunday afternoon performance but despite her best efforts the bronc came out the winner on this day and she did not qualify for any prize money. For the second year in a row the rodeo trade show was completely sold out and saw thousands of people wandering through the stalls, perusing everything from picture frames made from antique wood reclaimed from old barns, to western themed cookbook stands made from horse shoes, to plastic and cork pop guns that really popped, to new trucks and highly addictive chocolate snacks! A big draw for the trade fair was the increasingly popular Country Idol competition. Each year the contest has grown and this year there were winners in multiple categories including Senior Winner Jason Gies who drew crashing applause, whistles and shouts from the audience upon the completion of his final song. There were near record entries for the parade this year as well, with 109 different organizations and floats walking, wheeling and trotting their way down 50th Street. One notable entry was the Al Shamal Shriners who showed up with six distinctly different components to their entry. Overall the parade took over an hour to pass by which satisfied young and old alike with all the treats being handed out. This parade was very unique in that along with the traditional candy tossing a couple of the entries even thought of the adults in the crowd, with Tim Horton's handing out packets of coffee as a "treat"! The Leduc Regional Family Fun Fair put on in cooperation by City and County FCSS, the Black Gold School Division and the BGRA was a big hit with both parents and kids. A petting zoo, multiple bounce houses, and sumo suit wrestling were just a few of the activities geared toward the younger crowd. And while the kids were venting some of their cotton candy induced energy on the Velcro wall mom and dad could check out many of the informational booths packed into the LRC curling rink with more than 20 family friendly organizations represented and providing information on their services all for free. Always a crowd pleaser the pet parade at the Family Fun Fair drew a wide range of entries this year with everything from Chi Chi the chihuahua in a snazzy blue bandana, to a pot bellied pig, and two extremely well behaved cats who lounged at the end of their leashes and took all the craziness of the Fun Fair in stride. And since no one could find a pet that did not excel in one form or another, each proud young pet owner went home with a prize. The Saturday night Cabaret featuring Kory Wlos kept boots stomping and skirts twirling into the wee hours of the morning, and the breakfasts offered each a.m. served by either the Leduc Lions Club, the Dairy Congress, or the Black Gold Rodeo Assoc. got even the most bleary eyed cowboy back into gear for the next day of action. The only less than stellar note to the entire weekend seemed to be the fact that Leduc once again had a smaller midway than normal, but people still made the most of what was offered, and when the sun came out on Saturday afternoon the rides, games, and food stalls had line ups throughout. Something new in the midway area this year was a truck selling 80 different flavours of ice cream which was very popular on Saturday, but not to be outdone, another food truck selling elephant ears and other goodies had probably the best tasting corn dogs of any fair anywhere! With the Black Gold Rodeo now in the rear view mirror for 2013, for those of you who have not had their fill of rodeo yet, or if for some reason you had to miss the Black Gold event and haven't had your rodeo itch scratched yet, there are still many rodeos happening around the region over the next month or so. Most notably on June 14,15,16 the Wetaskiwin Rawhide Rodeo kicks up it's heels at the Wetaskiwin Ag Grounds along Hwy 13. These modern day cowboys are really thinking outside the box as there will be a brand new event here this year that pits barrel racers against dirt bikes! Yeehaw! See y'all at the rodeo!